Come down to the Venice Beach Skate Plaza on Sunday October 3rd, 2010 and celebrate the 1 year anniversary of the park opening. Venice has always been a pivotal community in the skateboarding world and this park deserves a celebration like no other. 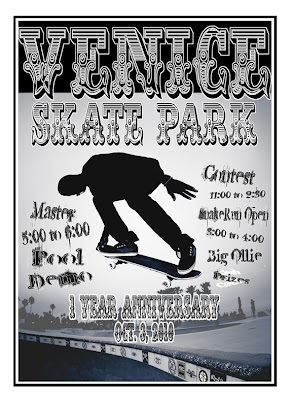 Join the Venice Surf and Skate Association as they host the Venice Skatepark 1 Year Anniversary Skate Contest and Demo. There will be a Snake Run Contest, Highest Ollie over the Hip Contest and a Masters/Pro Bowl Demo. Skaters can enter in the snake run and ollie contests for a $10 registration fee. There will also be a raffle and silent auction as well as product giveaways. Mob out to the beach and enjoy a sick sunday shred day.